Crazy day at work. I am not going to write that sentence again -- let's just assume from now on that if I went to work it was crazy; otherwise I am going to start every post Monday-Friday with that same line and it's just depressing! Was looking forward to putting the two little ones to bed, catching up on some work and relaxing while my husband took our oldest to karate. No such luck. Came home and my mom told me the baby was fine all day - he was jumping, he was dancing, he was laughing but as soon as it turned 5:00 he was lethargic and he was feverish. He is moaning/crying for hours and screams the second I leave his room. It's sad. Thankfully my husband is home now as he has the Midas touch with the putting the kids to bed. He got the middle one down, then took over the baby for me and now here I am on my laptop snuggled next to the big boy - who is playing a game on the kindle that he stumbled across and I bought for him called Baby Home Adventure. The game consists of having to sort laundry, plant flowers, clean the house. HYSTERICAL. Good, let him learn so he makes someone a good husband one day! Anyway, I don't have a ton of time to write tonight as I have oodles of work to do for my job and who knows what kind of sleep we'll get anyway given the baby is sick. So, let me hop right to it. I made for tonight's dinner a chicken, broccoli, rice casserole (not using canned soup). I found the recipe on food.com and it was pretty good. Get It Done Tip: If you have a Trader Joe's by you they sell organic (and regular) brown rice in the freezer section. I guess you can make your own rice too and just freeze it, but why bother when someone else can do it for ya and it's cheap, cheap! It is already cooked so all you have to do is dump it in your favorite dish to heat it up. Life changing. You can thank me later. I am going to need to take a food photography class...everything looks good in person, I promise! Cook broccoli until tender and toss with rice. Put in greased 9x13 casserole dish. Heat butter over medium heat in pan and add onions and cook until softened and just starting to caramelize, about 8 minutes. Turn off heat, add thyme, chicken, mayonnaise and milk, stirring to combine. 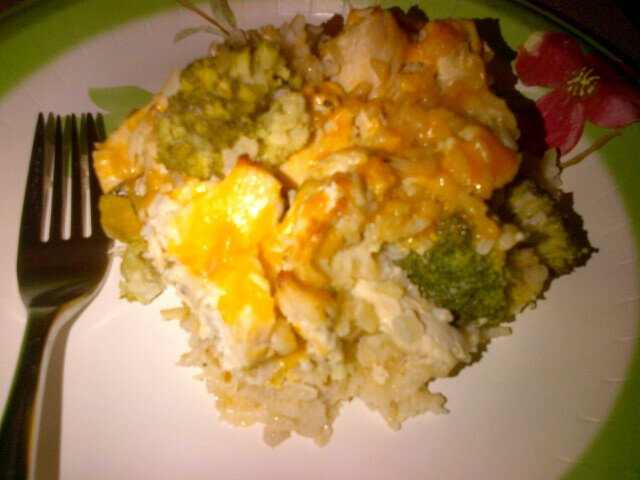 Add chicken and sauce mixture, 1 1/2 cups of cheese to broccoli rice and mix well. Cook at 350 degrees approx 25 minutes or until cheese is melted. I ate this with the baby laying lethargic in one arm, balancing the dish on my legs while watching my middle son naked pretending he was a rock star with lipstick all over his face and chest. You know, the usual.